"I went to a potluck and someone brought this dessert. A dense cake layer is topped with a rich blueberry and sour cream layer. This dessert is awesome! Serve with whipped cream and enjoy!" Preheat the oven to 375 degrees F (190 degrees C). Grease a 9 inch springform pan. In a medium bowl, stir together the flour, 1/2 cup of sugar, and baking powder. Mix in the butter by pinching between your fingers or using a pastry blender until the mixture resembles coarse crumbs. Stir in the egg and 1 teaspoon of vanilla. Pat lightly into the bottom of the prepared pan. Pour blueberries over the top. In another medium bowl, whisk together the sour cream, 1/2 cup of sugar, egg yolks and 1 teaspoon of vanilla until smooth. Pour over the blueberries. Bake for 60 to 70 minutes in the preheated oven, until the top is lightly browned. Cool, then run a knife around the edge of the pan. Remove the outer ring of the pan, and cut into wedges to serve. Incredibly Easy and Delicious - was a hit at the party. 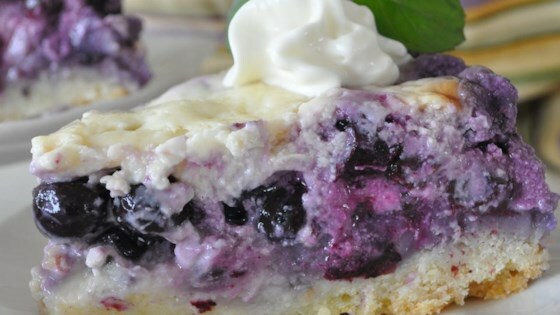 I would suggest folding the blueberries into the sour cream mixture before pouring on top of crust. Tried this after going blueberry picking. Very good. Crust was great. Almost like a cheesecake. This was great. My family ate the whole thing in one night.Thanks so much for sharing.I used frozen blueberries and it worked great.